The risk of developing thromboembolic diseases like deep vein thrombosis (DVT) or a pulmonary embolism (PE) is high in hospitals, but it can even continue up to six weeks after being discharged from hospital. Because of this, it's vital that you can properly reduce the risk of these potentially fatal events occurring. 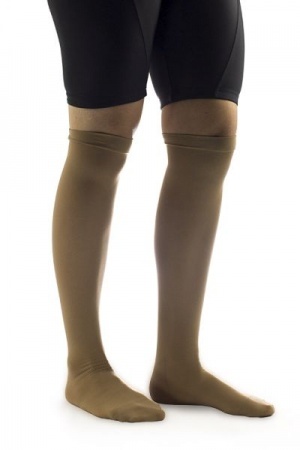 The Covidien TED Beige Knee Length Anti-Embolism Stockings for Continuing Care have been developed to reduce the risk of thromboembolic diseases developing in recuperating patients. They utilise a graduated compression pattern to help increase blood flow rates, preventing blood clots from forming in the leg. TED stockings are the only anti-embolism stockings which have been clinically proven to reduce the risk of thromboembolic disease, where blood clots (most commonly formed in the leg) break free and travel to the lungs where they obstruct the pulmonary arteries and restrict blood flow. To reduce the risk of clots developing, the stockings utilise a graduated compression pattern to encourage blood to quickly move through and back up the leg, helping to reduce the chance of blood clots forming in the leg and reducing the risk of fatal pulmonary embolisms occurring. As well as being highly effective, the stockings are also incredibly comfortable to wear. All Covidien TED continuing care stockings are latex free, reducing the risk of allergic reactions, and the stockings also feature a closed toe to make them feel comfortable and natural on your feet. To find the right size for you, measure your calf's circumference at its thickest part, and measure the distance from the bend of your knee to the bottom of your heel at the back of the leg. If possible, take these measurements in a standing position. For conditions that may make the anti-embolism stockings unsuitable for your needs, please see the "Contraindications" tab at the top of the page. Covidien TED Beige Knee Length Anti-Embolism Stockings for Continuing Care are non-returnable and non-refundable on grounds of hygiene. Bought these socks for my next air journey, they look really good can't wait to wear them. The stockings arrived quickly and are particularly comfortable to wear, which is surprising in a heatwave. The only negative is that they are approximately an inch too long. I ordered these stockings because they were the same make as the ones I was provided with whilst in hospital so I knew the quality would be excellent and I was not disappointed. They fit well and stayed up all day. To early yet to comment on how well they will last. Delivery was very prompt.